"I am terribly sorry, I am terribly sorry!" I woke up in the middle of the night by an, in the dark, pretty scary person coming up my stairs to the upper floor, where I sleep. It was Anne Hudson! I did not even know she was coming. In those days we could sleep with our doors open and there was always a bedroom in the cellar for our friends to just walk in and use. Often we had a nice surprise in the morning. But this time Anne, for some reason, had forgotten to change her money on the boat from England and then she could not pay for the taxi out to our place. This was very typical of Anne also not letting us know, that she was coming. But she was always welcome. We loved Anne very much and were happy she choose to stay at our home. I do not really know much about Anne except what I could see for myself. She was obviously very talented as a finger painter. I liked her Siameses and her horses best. She had a way of making their elegance show. As she travelled around Europe to different cat shows, she picked up peaces of the different languages and nearly learned to speak them! Another talent of hers. I do not think she had much schooling and her English was of a cockney dialect. At the shows you could find Anne sitting on a stair with all her colors and stuff spread around her. Anne had long greyish hair and often wore long skirts. This gave her a bit of a hippy appearance. If you look out the window at the back of my house, you do not see much. There is a high mountain wall going almost straight right up. One day Anne says "What a lovely mountain! Look at the fine structures and patterns." This made me very happy since Anne is the only person, who has seen the beauty of my lovely mountain except for myself. Things like that makes you feel closer to someone, doesn't it? One day I had a very sad telephone call from Anne's son. He told me Anne had developed a very fast kind of cancer and died. It was a nasty chock, but I am very grateful he contacted me. I am also very grateful that I got the opportunity to get to know Anne, a so very fascinating woman. I found your page on Google Image, while I was looking for information on Anne Hudson. 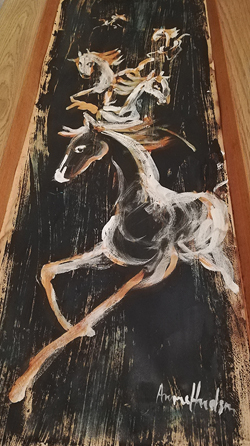 I have recently acquired one of her paintings although I have been familiar with it for about 26 years. I work in a furniture shop and they had two of her paintings on display although as far as I know they were not for sale. Following a clear out, I acquired one of these paintings which I have always admired. 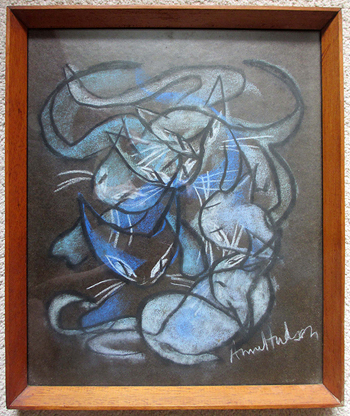 It is a painting of 3 cats on the move, very simple lines but very affective. The second painting which is still hanging in the shop is of Ballet Dancers, again very quick and simple lines. I have attached photos of the two paintings for you to see. I was so pleased to discover your website. I have tried on and off for years to find out about Anne Hudson and now finally I know something about the life of this wonderful artist. 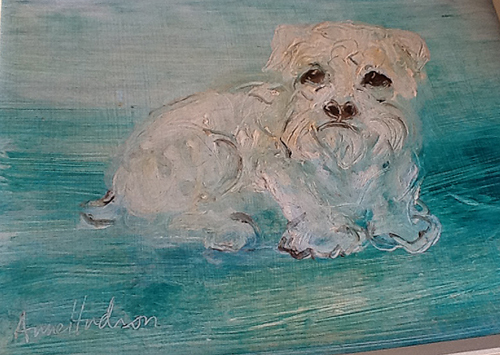 I'm sending you a photo of our much loved Anne Hudson oil painting. It was given to us by my brother and his wife as a wedding gift in 1974 and has had pride of place in our house ever since. My brother worked in a Fine Arts Dealers called Felix Rosensteil in their Edinburgh warehouse at that time and bought the painting from there. So nice to see so many examples of her work. And now I have a new contact. Isn't it absolutely awesome! Thank you for providing information about Anne Hudson. I live in Vancouver, B.C., Canada. 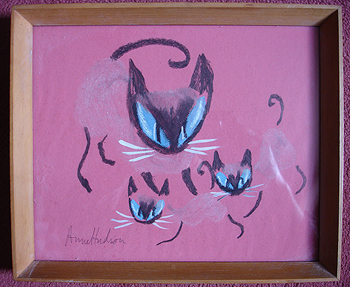 Many years ago I purchased an Anne Hudson painting for a few cents in a local thrift store. It is the drawing of a single Siamese cat. I find the painting stunning in its simplicity and accuracy. I had the painting hanging on my front veranda for some time. One day a young woman stopped and said, “Oh, my gosh, where did you get that painting? My grandmother who lived in West Vancouver bought a painting just like that many years ago in London, England. That was the closest I ever came to knowing anything about the painting or the artist. .... will try to get a friend to photograph and forward a picture of the painting to you. Once again, thank you for solving a mystery. "Yes, the first photo you received was the back of my Siamese cat, Ricky. Hope now you have one of him sleeping under the Anne Hudson painting and one photo of the painting itself." Today I received "the jewel of the crown" and one that I have been hoping for. A mail from one of Anne's relatives. I am the daughter of Anne Hudson. It was lovely to come across your site, with the kind words about my mother and photos of her paintings. Sadly Anne died in 1977, at the young age of 57. 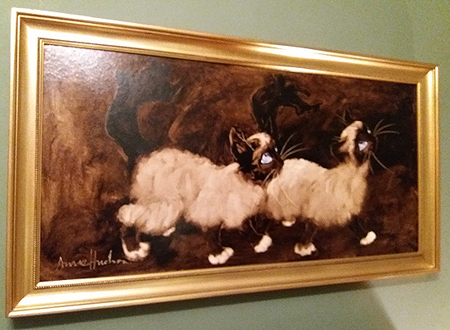 She had always painted throughout my childhood, but in her later years she started traveling with her pictures to cat shows in the UK, Scandinavia and Europe. She loved it, and sent home many letters, telling us of new friends she'd met and places she'd seen. I think it was one of the happiest periods of her life, and I'm so glad she got to do it before she died. 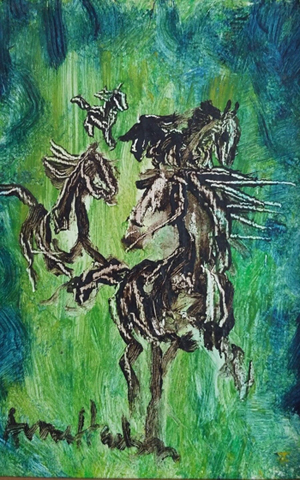 Anne mainly painted cats, but as your site mentions also painted horses and ballet dancers. She painted dogs and trees, and a few portraits, mainly of the family. It was a bit of a hand to mouth existence and she would paint whatever she thought would sell. My Father died a couple of years ago and my brother and I have quite a few of mum's paintings and a box of letters about her trips abroad, which I intend to transcribe when I get the chance. As I type this one of mum's pictures of a beautiful green eyed tabby cat looks down at me from the wall! I have forwarded a copy of your response to my brother and sister, as I know they will be interested. I have recently retired and my partner and I share our time between England and Italy. Currently we are in Italy and most of Anne's paintings are in our English Home. I will photograph some of the ones here and send them to you. Also mum's letters and my photo albums are in England. We return in November. I looked at the pictures of your home it looks lovely. Mum fell in love with Sweden. She did a painting of my brother lying in a meadow, which I think was inspired by the death of an artist, I can't remember who. I'll be in touch soon when I have photographed some of mum's paintings. I have three etchings by Anne Hudson which I bought in a London pub way back probably in the mid 1960's...would this be possible I know nothing about the artist or when she started painting. They are in a brown media and it looks like wood or hardboard two small ones of ballerinas and a much larger one of two horse heads. They look like very early work..?Can you please throw any light on them I can email photos from my iPad if it helps. similar to those on your web page. They were given to me by my late Aunt - are they of any value and do you know who might be interested in purchasing them. I can send you photos of them. I took them out of their damaged frames and would like to know a bit more about them. 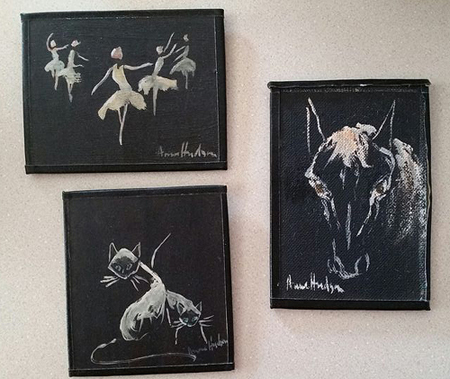 I live in the United Kingdom and have 2 finger paintings by Anne Hudson - of Ballerinas. Are you able to put me in touch with anyone who may be interested in buying them? I am really grateful for all the information on your site with reference to Anne Hudson. I have this wonderful monochrome oil on board which has great movement and I would love to know when it was painted? I suspect it was in the 50's judging by the frame? I also wondered if anyone would like to buy it as I will be selling this and other paintings from my new business Pelican Decor which opens in December. www.pelicandecor.co.uk info@pelicandecor.co.uk Looking forward to hearing from you. Suomen Rotukissayhdistys ry, SUROK has received such boards many years ago as a gift. Now we are selling these off, and I would ask, do you have a price estimate for the paintings? Paintings are not damaged, but these have not been framed. if you want, so you can get to publish these images on your pages exact year for these paintings we do not have and it would be wonderful to know it. Both paintings are really beautiful! I noticed that you like Anne Hudson pictures. I saw your post saying if you where lucky enough to find another. 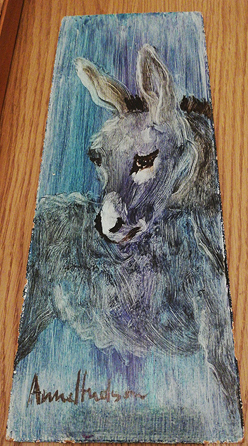 I have two Anne Hudson chalk pictures for sale and wondered if you would be interested. I am thinking of putting them on ebay but just thought you might be interested. My mother recently passed away and whilst sorting thru her things we came across these pictures. Do you know anything about them please. Hi Maud - Just doing a bit of research about Anne and thought you might like to see my picture. 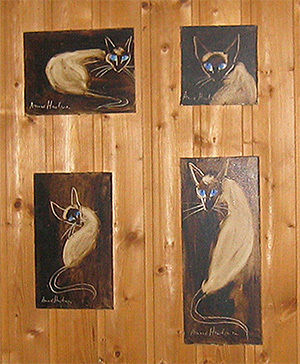 As a life long Siamese cat owner I adore it. It belonged to my parents so I imagine that they bought it from new. I always tried to prize it away from them but they wouldn't let me have it ! We are expecting two new Siamese kittens in the new year and I'm sure they will be as naughty as the ones in this picture. Hi Maud, I found this site while looking for more of Anne's paintings and I thought you might like to see the ones I have. My Mom & Dad went on a trip to England in 1964 and Mom bought these from Anne where she was selling them on the street. I love them and will never part with them! I think My Dad must have put the black tape around the edges of the small ones, so I will have them framed properly in the future. Thanks for having this site and allowing use to share Anne's work!! I've always loved this picture for its simplicity in generating so much 'emotion' for its viewer, and so was determined not to let it be lost from my family. My parents bought it whilst visiting London for a few days in (almost certainly) the early to mid 1950s. They said that they saw it "on a stall against the railings on the Embankment". I wonder if that would be direct from Anne herself? Over the years, the paper has faded from a vibrant red to a dusky pink (and this photograph has added its own variation) but the picture itself is still 'as bought' in its original wood frame behind glass. It's good to learn some of the history of these things. Hi Maud, thank you so much for your website. The attached picture was very precious to my late mother, as indeed it is to me now. It has always intrigued me and it has been a revelation to see it in the context of Anne's other works. If anyone is selling a cat picture by Anne, especially on black I would be very interested. My mother ran a Guest House in Newquay, Cornwall up until 1964 and I wonder if Anne ever stayed there. I'm not sure how else my mother would have found the picture. Feel free to use the picture on your website if you wish. I have just found your website and wonder if you would be interested in me emailing pictures of them to you and also I would like to sell and wonder if you know anybody that would be interested and their value. I have an Anne Hudson painting, but not very good at getting pictures from my phone or camera onto computer. It is one with a black background which is very like Elizabeth’s pictures on your website, but lengthways like Mark’s. I love it, although it used to scare me slightly as a child. Unfortunately my husband and daughter are not keen. I would love to get some more of these paintings, but not sure how too and not sure I could afford too either. I couldn’t believe that when I typed in her name on the internet her paintings and your website appeared especially as I thought my mum said it had been done by a college girl in Matlock, Derbyshire, England who was a babysitter. However she is unsure where it came from now as I doubt that Anne was in Derbyshire. If you know of anyone selling them I would be interested to know, but it would largely depend on the price. Thank you for your enthusiasm and creating a website to showcase my mother's painting. I have a very different outlook on my childhood and growing up from my sister. I thought that you might be interested in Anne Hudson from a very different perspective . Romilly wrote to you some years ago and also sent me a link to the website. I hope that this email finds you in good health? It is lovely to see some of my mother's pictures again. I have some of her cat pictures but none of the ballet dancers! It was good to see them on your website. As a child I did not fully appreciate her work because I was more concerned about keeping the house as clean and tidy as possible and looking after my little brother and sister. I can remember my mother taking us all to Green Park and the Embankment where she hung her pictures on the railings. We regularly went to Hampstead Heath and Brighton to sell her pictures. I sometimes tried approaching potential customers and to help her to sell her paintings by saying 'Can I interest you by any chance?' Taking her work to exhibitions was tough as we has no car and had to use buses, the London Underground or British rail with her paintings strapped to a very flimsy trolley with small wheels. The pictures would wobble on the trolley and become unbalanced and fall off. The weather was not always on our side as it could be wet and windy. Most of the time while my mother was trying to sell her painting I was looking after my siblings and keeping them away from the exhibitions until my mother was ready to pack up for the day. I cannot remember what we did for lunch but if she had had a good day she would take us to a local cafe for egg and chips or even a Chinese meal. My mother had a tough life as a struggling artist but as her eldest daughter I felt that I had to support her by trying my hardest to look after my younger siblings and I also struggled to keep the house clean as she spent most of the day and night painting. She drank cup after cup of black coffee to keep herself awake and smoked her foul roll up cigarettes. She smoked 'Old Boars Head’ tobacco which was very strong smelling and used to get everywhere as she crammed every last dog-end into her pockets. When I left home I feared that my mother would struggle to cope but life became easier for her as she had one less mouth to feed and she and my stepfather could be a nuclear family for the first time. When I left home I went to Italy for a year to stay with my grandparents and my grandmother helped me with my education as I was very behind. She was an excellent teacher and mentor and so I succeeded in going to college and training as a primary school teacher. Looking back leaving home was probably good for us both. At about this time my mother started to attend Cat Shows here and abroad. She really loved the Cat Shows as it involved talking to so many different people and talking about all manner of things. What I like about her pictures now is that they express her great love of cats and her appreciation of movement. I guess that is why I remembered the ballet dancer pictures too. I must have admired her work as a child too as I remember trying to draw cats using a question mark as the tail of the cats and her special outlines of ballet dancers. My sister is the cat lover but unfortunately I am not. My mother and sister are passionate about cats. My mother always called me the 'white sheep' of the family- was this a compliment or not? As a child all I wanted was to be 'normal' but now as an adult I appreciate being different and being able to be myself. I have only just come across your website and I thought you might like my little story, even though it is similar to others on your site. Many years ago I lived and worked in London and as an Aussie, of courseI l lived in Earl's Court. 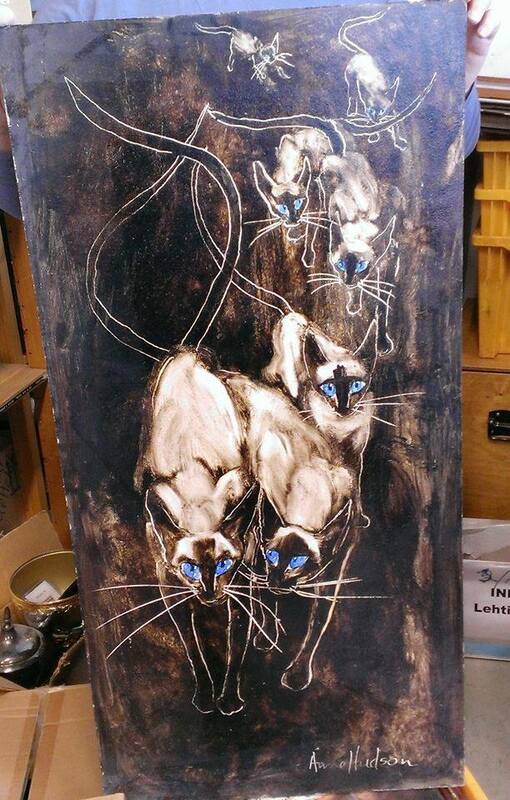 One day while walking around and taking in the sights, I saw this woman up a lane selling paintings of Siamese cats. As a cat lover, I had to stop and admire the pictures. They weren't very expensive. I paid less than a pound for a lovely cat painted on board and without a frame. Years later on a trip back to England, I saw one of her paintings in a shop window and thought, how nice she has got some recognition for her work, but of course I didn't know her life was sadly cut short. 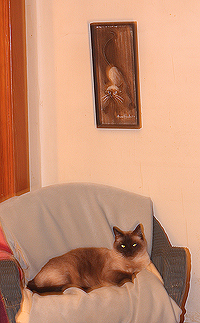 I love my cat picture, and it has been on the wall of my home in Melbourne Australia, for the last 46 years.